I would like to take this time to thank all of you once again for your wonderful care and support for our family as your representatives in Peru, South America and Beyond, reaching both the Deaf and hearing. We are continuing our furlough, visiting our supporting churches and friends and visiting several new churches and meeting new friends as we travel across the country. During this time, we have been encouraged and blessed as we have reacquainted with you. We have our return tickets to Peru for November 15th and have a great deal of work waiting for us. We are grateful to the Lord for the wonderful staff and ministry partners he has given us that keep the ministry going in our absence. Let me present to you a very special opportunity to be a further blessing and help to the work in Peru. As many of you know, my son James and his new wife Ann are on deputation to come to Peru as missionaries. They are planning a six-month mission trip, working on the field, allowing Ann to get to know the culture, languages and people of Peru, and helping them prepare for their move to Peru after deputation. They have their tickets to Peru for the 2nd of October 2018. 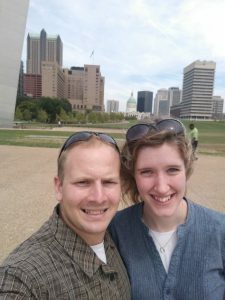 I would like to personally ask all of you if you would help James and Ann with either a one-time love offering to help them with the expenses of the six-month mission trip or if possible, if you could even begin supporting them as missionaries to Peru on a monthly basis either for this six-month trip or permanently. James grew up in Peru and now he is returning as a missionary with his new family. He is also expecting his first child in February. Many of you know or remember James from when we visited with you in the past. James now has a master’s degree in missions, a wonderful MK wife and a strong missions-focused testimony. He has helped teach at mission’s camp for the last several years to mission-minded college students. James is fluent in Peruvian Spanish and Peruvian Sign Language and before he went to college was an active leader in our ministry and is completely knowledgeable regarding Peruvian culture. His wife, Ann was born and raised in Japan and is no stranger to missions. She has had a love for the Deaf and a long-held desire to come to Peru, even before her courtship and marriage to James. When they return from this trip, we are hoping they will be able to raise their needed support quickly, so they can return and continue the work that God has called them to do. Thank you so much for your consideration for James and the overall mission work of Efata Ministries and the Kotvas family which you have been faithfully supporting. He is going to be a tremendous asset in our outreach and church planting ministries. Below is James’ contact information if you would like to reach out to him for further information. Feel free to call me as well – 813-406-2838. The Family is doing great. The kids are getting a great education visiting various national monuments and locations (D.C., Philadelphia, Mount Rushmore, Statue of Liberty, Gateway Arch St. Luis, etc.) as well as different areas of the US and Canada. God has used His people to be a tremendous blessing to us all along the way!!! Thank you to all. It is great to hear from you Bro. Joe, and exciting to know that James and family are headed this way. We love and appreciate you guys. We would like a pdf link to your prayer letters in order to print them properly for our Wall plaques.